A degree-constrained graph orientation of an undirected graph G is an assignment of a direction to each edge in G such that the outdegree of every vertex in the resulting directed graph satisfies a specified lower and/or upper bound. Such graph orientations have been studied for a long time and various characterizations of their existence are known. 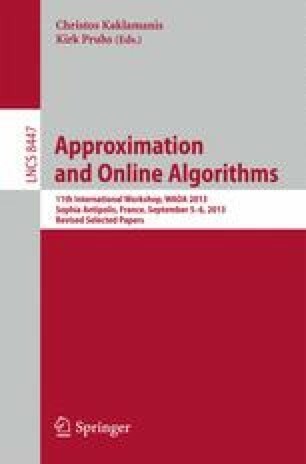 In this paper, we consider four related optimization problems introduced in : For any fixed non-negative integer W, the problems Max W -Light, Min W -Light, Max W -Heavy, and Min W -Heavy take as input an undirected graph G and ask for an orientation of G that maximizes or minimizes the number of vertices with outdegree at most W or at least W. The problems’ computational complexities vary with W. Here, we resolve several open questions related to their polynomial-time approximability and present a number of positive and negative results. Supported by KAKENHI Grant Numbers 21680001, 23500020, 25104521, and 25330018 and The Hakubi Project at Kyoto University.